We are a leading Manufacturer & Exporter of Industrial Shirt such as Half Sleeve Shirt, Combi Full Sleeve Shirt and Full-Sleeve Shirt from India. We provide these products in reasonable prices. These products are manufactured by making utmost use of supreme quality required basic material, at our established vendors' end. 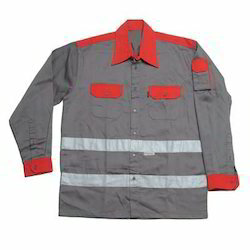 We are engaged in offering defect free Full Sleeve Safety Shirt¿¿which are qualitative in nature. Available in various colors, our clients are left with immense options to choose from. 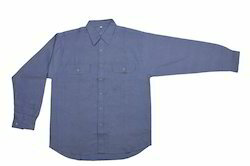 Fitted with proper buttons, pockets, these Full Sleeve Shirt protect from Chemicals. Avail from us an elite collection of Combi Full Sleeve Shirt which is fabricated using high grad fabric with rubberized coating. Available in L & XL sizes and in all color, our range is presented at affordable prices for our clients. Fitted with buttons, and pockets, our range provides protection. 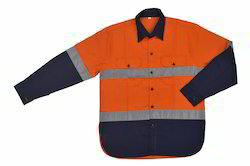 We are engaged in offering Industrial Full Sleeve Shirt, which are qualitative in nature. Available in various colors, our clients are left with immense options to choose from. 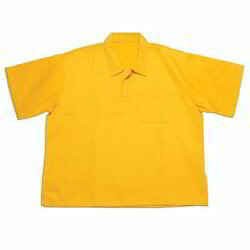 Fitted with proper buttons, pockets, these Shirt protect from fire and all chemicals. We are offering a range of Half-Sleeve Shirt that is put forward in a variety of sizes, colors and designs. Moreover, made available at industry leading prices, the range also meets the requirements of several clients. Our range is popular for its attributes like durability, reliability and superior quality. We are engaged in offering Half Sleeve Shirt. which are qualitative in nature. Available in various colors, our clients are left with immense options to choose from. Fitted with proper buttons, pockets, these rain coat protect from heavy rain.